With a recent spate of richly melodic, highly enjoyable and in the main, readily accessible albums reviewed, it seemed timely to take the plunge into the ever increasing depths of the TPA pipeline (albums awaiting review), and select something a little more leftfield. 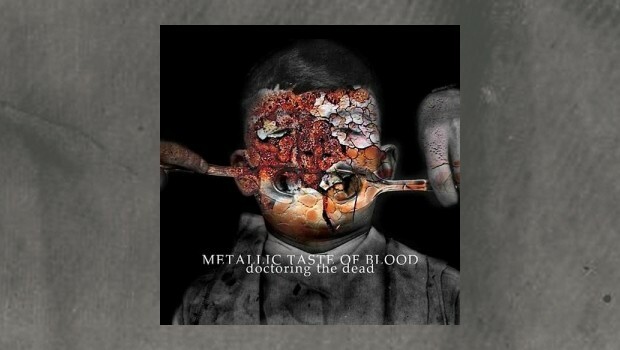 So the recent release from RareNoise Records and with the ominously titled Doctoring The Dead from Metallic Taste Of Blood, seemed an appropriate place to start. Those unfamiliar with the project, myself included, then a quick name-check reveals ‘former’ Porcupine Tree bassist Colin Edwin along with the slightly less familiar name of guest musician and keys player, Roy Powell. My only previous encounter with Powell was through the 2013 self-titled Mumpbeak album, which featured guests Pat Mastelotto and Tony Levin, amongst others. Unfamiliar names are Italian guitarist and sound-sculptor Eraldo Bernocchi and American drummer Ted Parsons. So returning to my opening statement and whereas Doctoring The Dead may not be richly melodic in the conventional sense, it is however accessible, and in the main, instantly enjoyable. Although I needed to get to about halfway through Pashupati before realising this was on the cards. Not that Ipsissimus isn’t a quality track, on the contrary the grinding, abrasive nature of the guitarscapes is nicely countered by Colin Edwin’s pulsing bass and Ted Parsons grooved drum beats. So why did it take until track two to make the decision that this album may be a winner? Mainly as Pashupati initially treads a different path to Ipsissimus. Parsons is once again on the money, aided and abetted again by Edwin. This time however the guitars are lighter and more spacious, initially that is, before the urgent riffage takes over the track – which ebbs and flows – but always moves forward. We are definitely in math/rock territory here, however the beauty of this beast is in the controlled nature of its complexity and in particular the foundation laid down by the rhythm section. Complex, but so, so solid and it is this strong, grooved foundation that allows the shimmering and more assertive guitar parts to shine through. 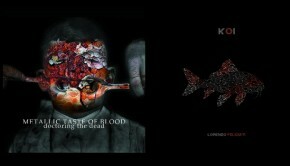 Combine this with, at times, cinematic hues, industrial hammering, ambient scapes, strong grooves and a healthy dose of metallic grinding then we are well on the way to discovering the music of Metallic Taste Of Blood. Perhaps an obvious comparator might be to those more avant periods in the Robert Fripp/King Crimson , but I wouldn’t like to drop this album into any neat compartments for the ease of reviewing. Granted there’s a strong avant undercurrent, discordant flavours and heavy riffage, within these eight instrumentals, however in equal measures there’s structure, hypnotic rhythms and a real sense of purpose. This is a hugely versatile and eclectic album that is far greater than the sum of its many parts, if you will. Ted Parsons is the restrained monster that relentlessly channels this beast, whereas Colin Edwin once again demonstrates his understanding of the bass and bass sonics adding warmth and depth to the music throughout. The saying “less is more” is amply displayed here in his performance. Eraldo Bernocchi is both the space in between, and the glue that binds all the parts together. Finally we shouldn’t forget Roy Powell’s contributions, adding that final layer of colour. You’ve got to listen to the album in its entirety to fully comprehend the breadth and depth of the music. Otherwise you would miss the atmosphere created by these guys. It’s not all “metallic”, in fact not a word I would employ to describe Doctoring The Dead, gritty may be more appropriate, but I would be more inclined to accede to the band’s own descriptor (above). Those familiar with RareNoise Records impressive output will, I’m sure, have already embraced this release, however those perhaps less familiar, or perhaps deterred by the band name and album title, then all I can say is this album is more approachable than the label on the tin might suggest.